1990 - certification in "Dermatology"
2013 - acquired the degree of "Doctor of Medical Sciences" - theme of the dissertation: "Biological products for the treatment of Psoriasis vulgaris - therapeutic, histological and immunohistochemical aspects"
2013 - acquired academic title "Professor". 2015 - Professor at the Department of Dermatology in "University Guglielmo Marconi, Rome"
2006 - 2015 - Head of the Department of Dermatology and Allergology, Military Medical Academy in Sofia. 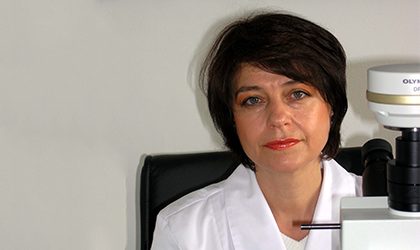 starting 2010 lecturer at the Department of Dermatology at the Medical Faculty of the University of Sofia. 2002 - 2015 - regular participant and speaker at workshops in the field of aesthetic medicine - IMCAS (Paris, France), AMWC (Monte Carlo), EMMA (Paris, France) 5 Continent Congress - Lasers and Aesthetic Medicine and other international dermatological forums . Scientific Secretary of the journal "Dermatology and Venereology"